The [Tool Property] palette displays when [Window] menu → [Tool Property] is selected. The [Tool Property] palette adjusts the settings of the selected sub tool. 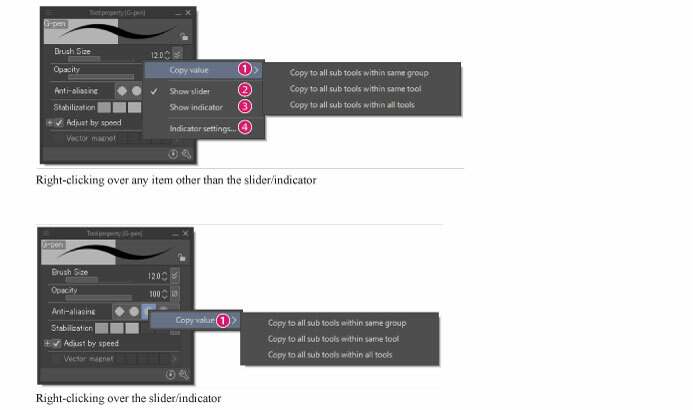 The display of items whose values are configured with a slider can be changed to an indicator. For details on how to change, see "Right-click menu [Windows/macOS]" . Previews the stroke of the selected sub tool. Saves the values configured on the [Tool Property] palette to the currently selected sub tool. When locked, the settings on the [Tool Prop­erty] palette can be changed but when the same sub tool is selected again, the settings are restored to those at the time of [Lock]. Locked sub tools are displayed on the [Sub tool] palette with a [Lock] icon. Allows you to adjust the settings of the sub tool selected on the [Sub tool] palette. Items available on the [Tool Property] vary depending on the selected sub tool. For tool-specific items, see "Tool List" . Resets the settings on the [Tool Property] palette and restores the selected sub tool settings to their initial values. When turned on, displays the [Sub Tool Detail] palette. When turned off, closes the [Sub Tool Detail] palette. The [Sub Tool Detail] palette allows you to edit the selected sub tool setting in more detail than the [Tool Property] palette. For details, see "CLIP STUDIO PAINT Tool Setting Guide". The following describes the functions included in the menu that displays when you click [Palette menu] on the upper left corner of the [Tool Property] palette. Saves the values configured on the [Tool Property] palette to the currently selected sub tool. When locked, the settings on the [Tool Property] palette can be changed but when the same sub tool is selected again, the settings are restored to those at the time of [Lock]. Registers the settings on the [Tool Property] palette as the initial settings of the selected sub tool. Opens the [Modifier Key Settings] dialog box where you can configure modifier keys for the selected sub tool. For details on the [Modifier Key Settings] dialog box, see "Modifier key settings [Windows] [PRO/EX]" . When turned on, displays category division line of the [Sub Tool Detail] palette on the [Tool Property] palette. When turned on, displays [Stroke preview]. When turned on, displays the command bar of the [Tool Property] palette. Hides the [Tool Property] palette. To display the [Tool Property] palette again, select [Window] menu → [Tool Property]. The following describes how to configure the palettes using the menu that displays when an item on the palette is right-clicked. When using an iPad, the right-click menu can not be displayed. You can perform the same operation from the menu displayed by clicking [Show Sub Tool Detail Menu] on the [Sub Tool Detail] palette. For details, see "Sub tool detail palette [PRO/EX]" . Switches the indicator display to slider display. [Show slider] displays when you right-click over a slider/indicator. Switches the slider display to indicator display. ·[Show indicator] displays when you right-click over a slider/indicator. ·The configured value is not displayed for indicator display. To view the currently configured value, click the tri­angular icon on the right side of the indicator. Selecting the menu item displays the [Indicator settings] dialog box. On the dialog box, you can register a value to each indicator bar. [Indicator settings] displays when you right-click over a slider/indicator. (1) Input a value in the input field of each indicator bar. Clicking the triangular icon on the right side of the input field allows you to con­figure the value with a slider. (2) Clicking [OK] registers the input values. When configuring values with the [Indicator settings] dialog box, be sure the values are decreasing to the left and increasing to the right.